We propose a 10-year, coordinated, multi-partner Parkdale Rooming House Preservation Strategy to preserve, maintain, and develop this disappearing stock of affordable housing. In September 2016 PNLT commenced a seven-month study to determine the number and condition of rooming houses in Parkdale and to assess the impact of gentrification and real estate speculation on rooming house loss. The scale of what we have found—both the size and importance of this affordable housing stock and the rate at which it is disappearing—has alarmed the research team, non-profits, and City staff alike. 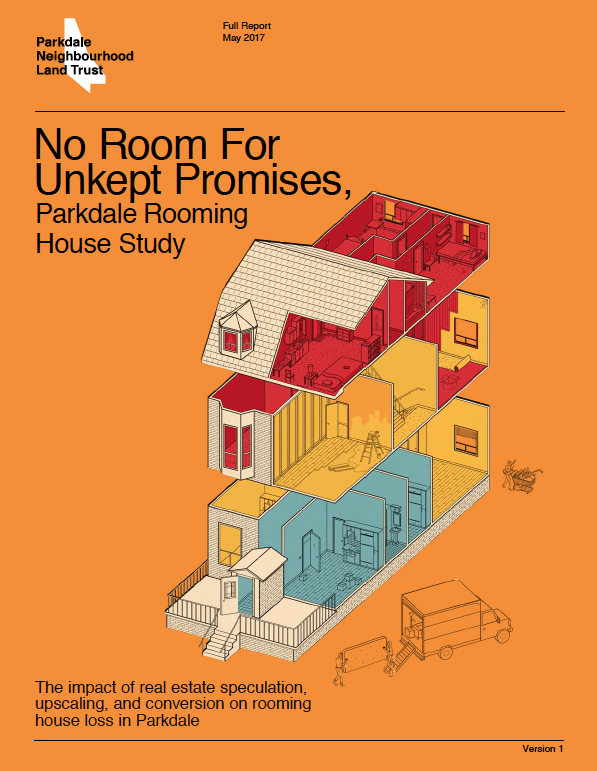 Our research found 198 rooming houses in Parkdale with an estimated 2,715 dwelling rooms — more than double the number of units owned by Toronto Community Housing within the study boundaries. We have also documented an escalating crisis of rooming house loss. The research confirmed that in the past 10 years, 28 rooming houses have been lost to conversion and upscaling, displacing an estimated 347 people. We believe 59 more, housing 818 people, are at imminent risk of being lost. The continued loss of rooming houses in Parkdale will be catastrophic to the lives of hundreds of mostly low-income, vulnerable residents who depend on Parkdale’s social and community supports and are at risk of eviction, displacement, and homelessness. We call on the non-profit and public sectors to respond urgently to this crisis. We propose a 10-year, coordinated, multi-partner Parkdale Rooming House Preservation Strategy to preserve, maintain, and develop this disappearing stock of affordable housing. As the Federal government is poised for a reinvestment in a 10-year national housing strategy, there is no room for unkept promises. The research was undertaken in part by Working For Change, a local community organization with significant experience undertaking participatory research with rooming house tenants. It was overseen by a steering committee including John Van Nostrand (JVND), Chris Persaud (Habitat Services), Victor Willis (PARC), Kuni Kamizaki (PARC), Omid Zareian (PARC), Joyce Brown (Working for Change) and more. Why we researched Rooming Houses? There is an escalating need for a coordinated approach to both retain and increase the stock of affordable housing in Parkdale, to prevent displacement and the risk of homelessness for low-income and vulnerable tenants. Historically Parkdale had received a high density of rooming houses, boarding homes and bachelorettes, a legacy rooted in the deinstitutionalization of psychiatric patients into community-based care in the 1970s and 1980s. However, in recent years this stock has shown troubling signs of decline, particularly in regards to privately owned properties. It is clear that Parkdale and other downtown neighbourhoods will continue to experience increased real-estate development pressure, driven by population growth, market interest, and a planning framework favourable to intensification. New approaches are thus needed to assure that these changes benefit, and do not hurt, middle and low-income people. A proactive, coordinated response is needed to prevent displacement and the risk of homelessness for vulnerable tenants. As identified in the Parkdale Plan, a public policy response in coordination with community and private partners is imperative (K. Kamizaki, Parkdale Plan, 2016. ).